Delegate: To be nominated , . During 2018 renewable energy in Germany saw record production levels with renewable sources accounting for 38.2 % of energy consumption - generating as much electricity as coal for the first time. These figures were achieved on the back of high levels of sunshine during the warmest summer ever recorded and 3 GW of photovoltaic construction - the first resurgence in PV since 2013. Wind generation also increased with an added capacity of only 3.7 GW almost 40% less than in 2017. Offshore wind provided 2.7% to the energy consumption with a production of 19 TWh and a total capacity of 6.3 GW at the end of the year and another 1.4 GW of new capacity expected for 2019 under the expiring previous feed in tariff legislation (EEG 2014). After years of decline, the tender results for new wind and solar power rose for the first time in 2018. The latest contracts are at 6.26 Cent/kWh for onshore wind and 4.66 Cent/kWh for offshore wind power and 4.69 Cent/kWh for photovoltaics. Not enough approvals for onshore wind energy and a still restrictive surface area for ground-mounted solar plants mean that, contrary to the international trend, the results of the tenders are rising in Germany. The draft for the so-called “Energy Omnibus Act” that entered the legislative process in November also envisages 'special auctions' to be held. These are designed to speed up the process of expanding the use of renewables and support the attainment of the climate targets. Over the next three years, an additional four gigawatts of capacity both for on-shore wind-powered installations and for solar installations will be auctioned. Under the new legislation, there will also be auctions for innovation. These are designed to test new pricing mechanisms or any other measures making the system more competitive. In summer of 2018 the Federal Ministry for Economic Affairs and Energy launched the Electricity Grid Action Plan to accelerate the expansion process by streamlining planning procedures and improving the way projects are overseen. Existing grids are to be optimised using new technologies and operating strategies. At a grid summit in September, Federal Minister Altmaier and the energy ministers of the Länder, who are responsible for most decisions relating to the expansion of the grid – including planning permissions – agreed on a legislative package to speed up the process of grid expansion. The Federal Government announced plans to provide € 6.4 billion in funding for energy research up to 2022 within the 7th Energy Research Programme adopted in September 2018 representing an increase of approx. 45% over the period from 2013-2017. The “living labs” or “reality labs” established as part of the energy transition will be made an essential pillar of energy research in Germany. This project type allows for experience to be gained and for regulations to be honed and improved before they are rolled out but in a limited pilot region over a limited period of time. Furthermore, startups are to be given better access to research funding. In contrast to the former editions of the Energy Research Programme, which only provided funding for individual technologies, the focus in the coming years will also be on horizontal issues such as digitisation and sector coupling (Source: Federal Ministry for Economic Affairs and Energy: “Energy transition progress in 2018” from 20.12.2018, http://www.bmwi-energiewende.de). In the public sector, around 15 R&D institutes and universities have been involved into developing wave, tidal current and osmotic power mainly in the framework of National and European research projects over the last decade. In mid 2018 the joint project “TidalPower - Development of a Platform System for Cost Efficient Utilization of Tidal Energy” came to conclusion. The project consortium led by tidal turbine manufacturer SCHOTTEL HYDRO delivered the ready-to-build concept of the “TRITON S40”, a semi-submersible platform carrying 40 SCHOTTEL HYDRO tidal turbines rated at 2.5 MW, as well as an improved design of SCHOTTEL HYDRO’s “SIT 250” tidal turbines. Due to a major revision in SCHOTTEL’s business strategy focus of development was directed away from large platforms like the “TRITON” in favour of small platforms like Sustainable Marine Energy’s (SME) “PLAT-I” floating platform, a trimaran equipped with four of SCHOTTEL HYDRO’s tidal turbines and rated at 280 kW. The platform is currently deployed at the Grand Passage in the Bay of Fundy, Canada, for sea trials (see Figure 1). SCHOTTEL HYDRO, together with part of the TidalPower consortium (Potsdam Model Basin (SVA) and Fraunhofer IEE) and new partners (the Institute of Fluid Mechanics and Hydraulic Machinery (IHS) at the University of Stuttgart and the Center for Wind Power Drives (CWD) at RWTH Aachen University), applied for a successor joint project called “Optimization of a Floating Turbine System for Harnessing Tidal Energy” in 2018, aiming at further improvement of the SIT technology. The project could start in Q1 2019 and would run for 2 years. Furthermore, in 2018 SCHOTTEL HYDRO delivered a power take-off system rated at 500 kW to Swedish tidal kite developer Minesto for utilization in Minesto’s “Deep Green” technology in context with the “Holyhead Deep” project in Wales, UK, which concluded in November (source: SCHOTTEL HYDRO). 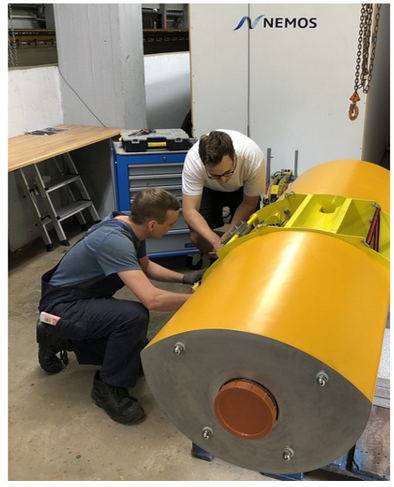 The NEMOS GmbH together with Uni Duisburg Essen, the Development Centre for Ship Technology and Transport Systems, Schaeffler Technologies AG and LIROS GmbH, continued the development of its wave energy conversion technology in the joint project “Design, Manufacturing, Installation and Commissioning of NEMOS Wave Power Plant Model at 1:1 Scale”. Two of the five sub-projects have concluded yet, delivering the design of an anchorage system and the hydrodynamics, construction and measuring technologies for the WEC. Progress has also been made on the design and construction of a tower serving as WEC foundation, due to be installed in Oostende in 2019. The premanufactured foundation for the top structure was delivered to a shipyard in Poland in December, while first components for the WEC itself have already been ordered. Furthermore, NEMOS successfully tested the first scaled model of their WEC in 2018: The 1:3 scale model (see Figure 2) was tank tested at the DST Duisburg and later deployed at the Nissum Bredning nearshore test site. (source: www.nemos.org). 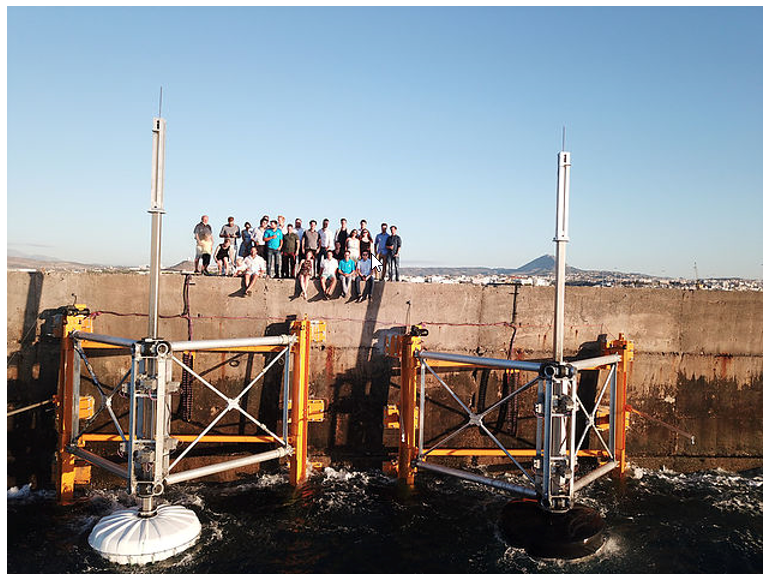 Wave power developer SINN Power GmbH continued the work on the project “Testing of a Modular Concept for the Generation of Grid Conform Electricity from Irregular Ocean Waves in a Generator Array” which was started in 2017. The project runs until July 2019 and is supposed to deliver four additional WEC modules to the existing test site at the port of Heraklion, Greece. Two second generation WECs were successfully put into operation in July (see Figure 3). Furthermore, a floating WEC grid of 21 modules is planned to be installed at an organic shrimp farm on the island of São Vicente, Cape Verde. In March it was agreed between SINN Power and customer Fazenda de Camarão to launch the project shortly with a detailed feasibility study and measurement campaign. In August, SINN Power announced the launch of a paid feasibility study in West African Guinea. On behalf of customer Guinea Gold PLC, SINN Power was commissioned to conduct a 9-month feasibility study in the Guinean capital of Conakry to assess the potential of wave energy and other renewable sources of energy. In this context SINN Power installed autonomous measuring systems for renewable energies in Conakry in November, opening the second phase of the project. 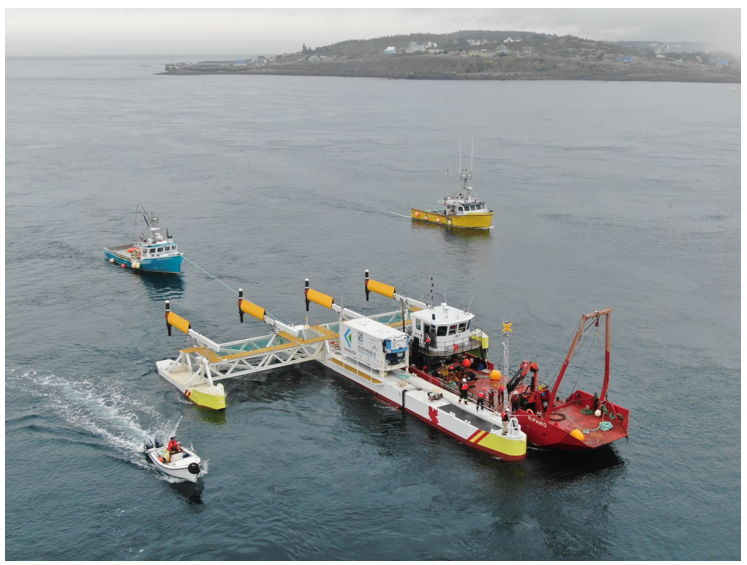 The aim of the feasibility study is to make a site-specific recommendation for a renewable hybrid system including wave energy (source: www.sinnpower.com). Other German suppliers, such as Bosch Rexroth, Schaeffler, Contitech, Thyssen Krupp, Hunger Hydraulik and Hydac deliver components and parts for a number of ocean energy devices – for wave as well as tidal turbine technologies, mainly in Europe. Certification companies such as the DNV GL-Group and consultants are contributing to the technology and project development in the sector. This international collaboration demonstrates the technology export opportunities, which exist in ocean energy for the German industry. Marine Spatial Planning (MSP) is used as a decision making tool in all activities developed in the North and Baltic Sea. However, there are no defined areas for ocean energy in Germany and the MSP regime does not specifically consider ocean energy developments. Nevertheless, areas for offshore energy power production have been specified and implemented by the Federal Government’s strategy to wind energy use at sea (2002), which is part of its overall sustainability strategy. This plan aims to create framework conditions for offshore wind energy potential to be exploited, in addition, the Federal Government’s Energy and Climate Programme (IEKP) of December 2007 formulates the goal of increasing the proportion of renewable energies in electricity production. The Federal Ministry of Transport, Building and Urban Development (BMVBS) has determined the targets and principles of spatial planning for the German Exclusive Economic Zone (EEZ) in the North and Baltic Sea with regards to economic and scientific use, safety and efficiency of maritime traffic as well as protection of the marine environment. The MSP covers all three dimensions of the marine space (surface, water column and seabed), and identifies specific zones for maritime activities. The spatial plan for the EEZ is available for public consultation in the libraries of the Federal Maritime and Hydrographic Agency. The Federal Maritime and Hydrographic Agency (BSH) is the federal agency overseeing licensing for renewable energy projects in the EEZ based on the Maritime Spatial Plan for the North and Baltic Sea. Within the 12 nautical mile limit, i.e. in the area of the territorial sea, the German coastal states are responsible for the approval of renewable energy, because an approval granted by the BSH for installations in the EEZ is not legally binding for approval procedures involving installations on land and in the territorial sea. The BSH and the competent regional Waterways and Shipping Directorate also examine whether the project would constitute a hazard to navigation. For a wind farm project to obtain approval, the regional Waterways and Shipping Directorate must have consented to it under the aspect of navigation safety. The Federal Energy Regulator (BundesNetzagentur) is in charge of approving applications for an offshore grid on economic grounds. • If required by the BHS, the applicant prepares an Environmental Impact Assessment (EIA) and a risk analysis to be reviewed by the BSH and if requirements are met the project is approved. There is no specific authority responsible to manage the ocean energy consenting process (“one stop shop” facility or entity). In the EEZ, the potential impacts of the planned facilities on the marine environment have to be assessed. An EIA is assessed on a case-by-case basis. The responsible for the decision on whether an EIA is required is the BSH. In the course of the approval procedure, the BSH reviews whether the marine environmental features to be protected are at risk by the project deployment and informs the project’s proponent if they are required to perform an EIA. As for offshore wind energy, the process is much clearer since offshore wind farm projects comprising more than 20 turbines require an EIA based on the Environmental Impact Assessment Act (UVPG). • To establish a basis for evaluating the monitoring results. There are no specific EIA steps for ocean energy projects, therefore these projects are considered under the existing legislation for the offshore wind sector. There are no well-defined procedures to obtain consent for ocean energy, therefore these projects are considered under the legislation designed to the offshore wind sector. The legislation used to regulate offshore renewable energy deployments in the North and Baltic Sea is the Maritime Spatial Plan. The consultation process starts upon the submission of the projects application to the competent authorities. A larger number of stakeholders are involved in the process: the public has the possibility to inspect the planning documents. Mandatory consultees include all competent authorities (including the regional Waterways and Shipping Directorates, mining authority, Federal Agency for Nature Conservation) associations (e.g. nature protection, commercial and small craft shipping, fisheries, and wind energy associations) and the public. Subsequent to the second round of participation, an application conference is held during which the applicant has the opportunity to present the project. Conflicting interests and uses are discussed, and the scope of investigations required to study possible effects on the marine environment is determined. There are guidelines for the promotion of offshore wind energy use in accordance with the Federal Government’s sustainability strategy. These guidelines can provide helpful inputs for the developers of ocean energy projects.